Junior Alysa Ross dances with Wynnie Roarty. 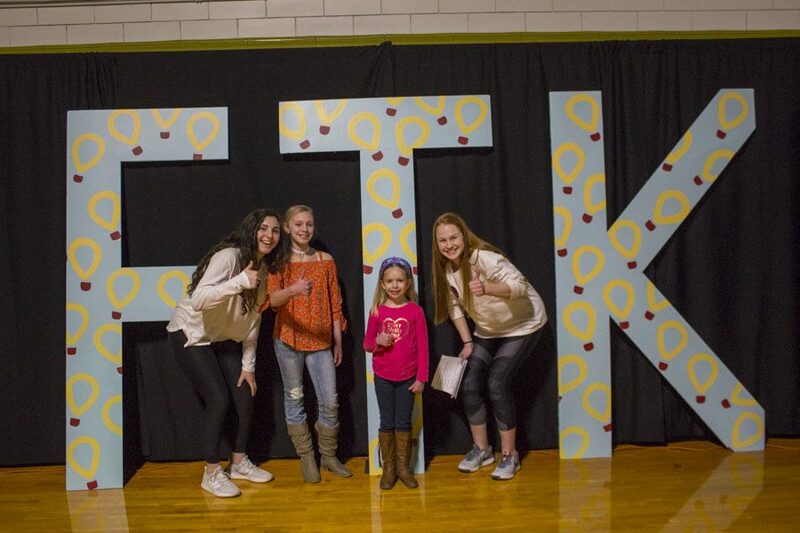 Seniors Olivia Collins and Maddie Fraiji hosted the first annual Patriot Dance-a-thon, to support the Johns Hopkins Children’s Center for their Senior Project on Saturday, Jan. 27. The event featured a night full of dancing, music by DJ Brady Fritz, class of ‘15, a students versus teachers dodgeball game, mega twister, and life-sized water pong. The community danced for six hours to raise awareness for all the good that Johns Hopkins does every single day. Prior to the Patriot Dance-a-thon, students who wanted to get involved were assigned to teams named after nine children at Johns Hopkins. Lucy, a 6-year-old from the Children’s Center, was able to attend the event. “Lucy [had] parents [who] were John Carroll alumni, so it was really good to get them back on campus,” Fraiji said. Collins and Fraiji started planning the event after Collins was contacted over the summer about hosting the first ever high school Dance-a-thon. “We wanted to have a fun time and wanted to raise awareness for Johns Hopkins and try to raise money for the kids,” Collins said. They started planning in September and met every weekend since November to ensure that this event was a success. Collins and Fraiji hope that the Dance-a-thon will become a school-wide tradition. In the years to come, they believe that the event will attract “a lot [more] people” because it’s “a fun night for the community to come together,” Fraiji said. Sarah Spaeth is the Copy Chief and Madison Dailey is a Community Editor for The Patriot and jcpatriot.com. Seniors Maddie Fraiji and Olivia Collins smile alongside Lucy, from the Children’s Center at Johns Hopkins, and her sister Annie.